VHF radio is the mainstay of coastal communication and essential for emergency communications. Digital Selective Calling (DSC) is rapidly becoming a reality as more Coast Guard Rescue 21 System operations go live. Currently, the mid Atlantic coast is operational with DSC. The Gulf region will be operational early next year and all Cutters will be DSC equipped by next year. DSC vastly simplifies and improves rescue and routine call signaling – making it easier to make a call while the system frees up Channel 16 for essential communications. However, you need to know how to use it. 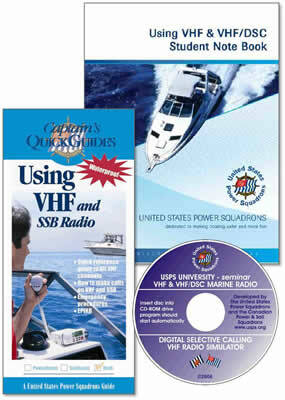 This seminar answers those needs and explains basic VHF operation. A CD is included with a DSC Simulator that allows you to practice on your computer at home. A handy waterproof McGraw-Hill Captain’s Quick Guide Using VHF is included with essential information that you should have aboard, which will explain to anyone on your crew how to use the radio.